The 12 volts 12 amp High Rate HRT Sealed Lead Acid 12V 12Ah SLA Rechargeable Battery for devices that needs higher performance The 12v 12ah deep cycle battery can replace any brand and fit perfectly any device with the same capacity it is maintenance free with terminal: F2. SKU: KT-12120-HRT Series. Highest quality 99.994%, the Purest Lead Ingot row material, ABS resistant case , Own technology grid design and Special REINFORCED paste formulation for High Drain Devices as Wheelchairs, UPS, Scooters, Medical Equipments, Motorsports and ATV's and KEYKO ® AMG Deep Cycle TM high standard Absorbed Glass Material separators, guarantee better electrolyte conductance between plates, and giving more energy when is demanded. 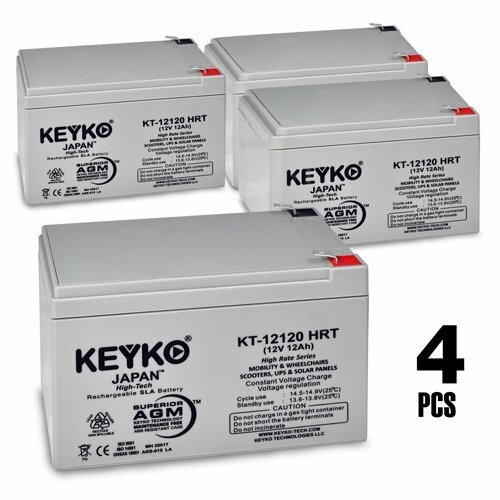 KEYKO KT-12120-HRT Series High Rate Deep Cycle replacement battery are safe to operate in any position (VRLA) manufactured with the highest standards to provide superior performance and long service life. Replace any brand and fit perfectly any device with this same capacity: CASIL CA12120 POWERSONIC PS-12120 UPG UB12120 12FM12 RHINO 12V 12Ah SLA12-12. Check all Product details and Product description below for more details.